Here are some photos of the mixers on display shelves. Most are toys that were meant to be played with. Some are models, and some are salesmen's samples. 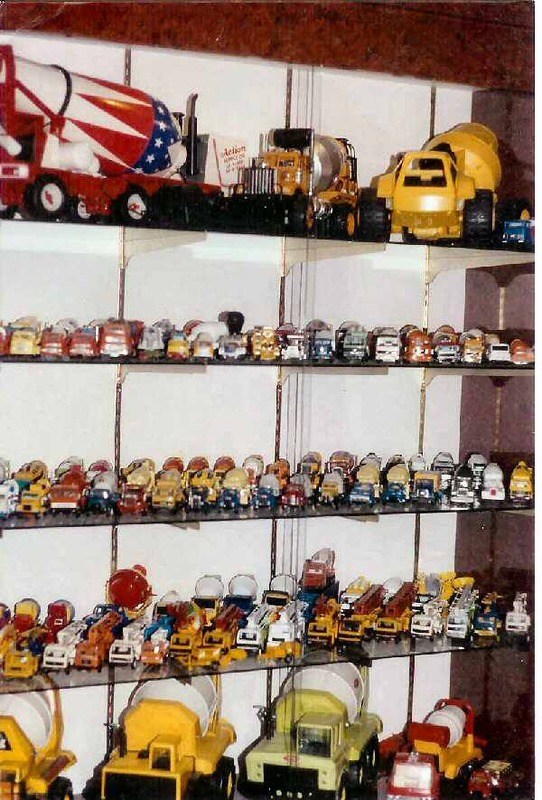 All of the great toy names are represented in this collection: Buddy L, Tonka, Structo, Matchbox, and of course, Marx, Mattel and Kenton, 1st Gear and Conrad. Smith Miller, Hubley, Doepke and many more. 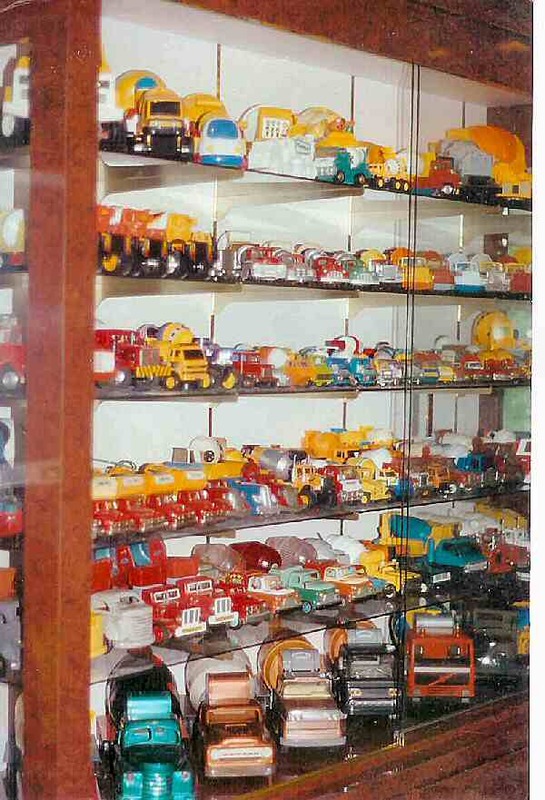 The toys followed the development of the real machines. As the real transit mixers became larger and more powerful, the toys too had more tires and bigger mixing barrels. Front Discharge mixer toys started showing up soon after the real mixers appeared at construction sites. Concrete Mixer Toys come in all sizes. They're also made from almost everything imaginable; wood, plastic, crystal, tin, steel,pewter,cast iron, ceramic, and die cast. 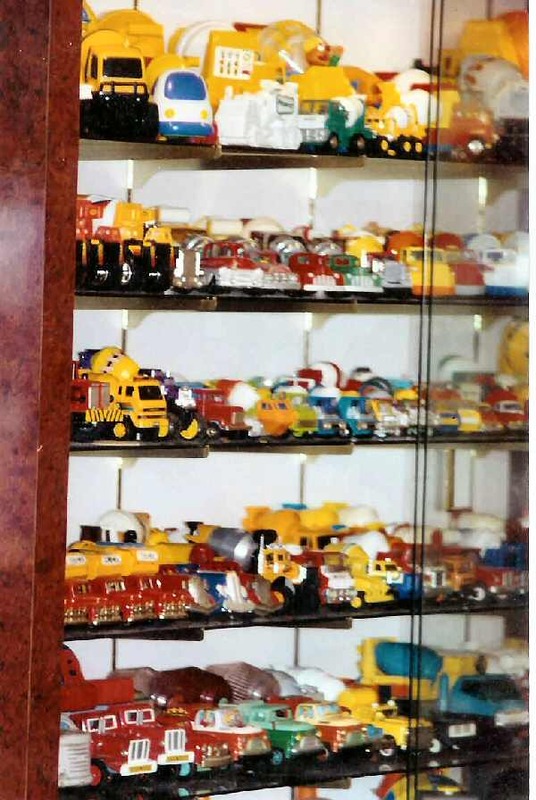 Duplicates and boxes are stored above the display cases behind cabinet doors.Extra parts and other miscellaneous items are stored in the drawers below. Each item in this collection including the duplicates, has been individually photographed and cataloged.